Jack Crifasi announced that Charlie’s Seafood will be opening in Piper’s Crossing. Anchoring the eastern end of the center, Charlie’s Seafood & Pub, a new family-oriented seafood restaurant, will be operating where Cider Press Cafe was located. 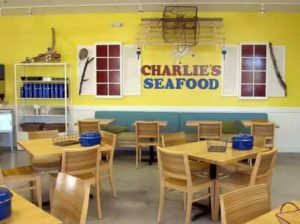 Charlie’s will include a fresh seafood market featuring clams and crabs. In fact, the entire restaurant will revolve around fresh – including its own herb garden along a covered patio. “That is definitely going to be a different kind of place. There really isn’t anything quite like what they’re going to do there,” said Jack Crifasi, the manager and leasing agent of Piper’s Crossing. Jack Crifasi announces the lease of space to LuLu B’s Diner in the Green Tree Shopping Center. Lulu B’s will be taking over the space that Erika’s Cafe and Gift Tree occupied. The new diner will serve breakfast and lunch with a retro theme that celebrates the ‘60s, much like the original cafe, which will remain operating in Marketplace at Pelican Bay. “It’s a fun restaurant. We try to keep a fun atmosphere,” said Holecek, sporting purple-tinged hair. 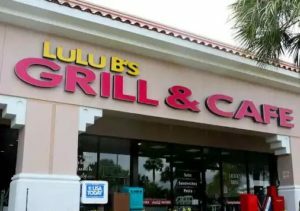 Lulu B’s extensive menu features favorites such as top-rated burgers and BLTs with a twist, as well as breakfast classics served all day. Other specialties include omelets, homemade soup and salads, deli sandwiches, malts and shakes. Daily blue plate specials serve up nostalgia with Sloppy Joe’s, meatloaf and open-faced turkey sandwiches. 2016 Compare to 2017 – A Good Year? Focus on Restaurant space. According to Jack Crifasi, 2016 saw an increase in restaurant leasing activity compared to 2015. This trend will continue into 2017 as the economy continues to recover. There are currently very few restaurant locations that are built out and available for lease. This means that a restaurateur looking to open a restaurant in a strategic location will have to consider doing a build out on their space. The availability of restaurant space is also impacted by the parking and zoning available. There are just so many restaurants that can go into a shopping center. We see a continuation of this tightening for restaurants into 2017 as 2nd generation restaurant space continues to dwindle. Because of these factors, availability will be reduced causing prices to increase for leasing restaurant space. Home to Sweetbay and NCH as well as many other retail shops and restaurants, Greentree Center is situated at one of Naples busiest lighted intersections, Airport and Immokalee Road. This development has visibility from all sides! Close to all including Sam’s Club, Naples Community Hospital, many other medical offices and retail businesses. Easy access and close to I-75 corridor. One of the premier locations in Collier County. This popular shopping center has lush landscaping, water fountains and wide paver walkways. The center is situated at one of Naples busiest lighted intersections at Airport and Immokalee Road. The shopping center has high visibility from all sides! 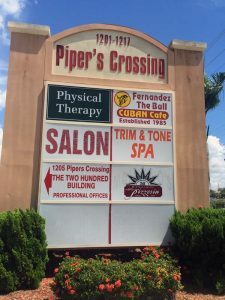 Close to Sam’s Club, CVS Pharmacy, Naples Community Hospital and many other medical offices and retail businesses. Large residential communities surround the shopping center with large local populations counts and high income demographics. The center has easy access to the I-75 corridor.